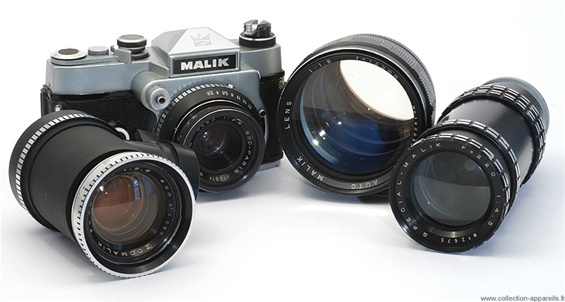 The following cameras were series produced in small numbers. Zunow of Japan. 1958. Produced for a short time. Number unknown, but very few. Some 550 copies, as stated below. I have seen three -3- for sale. 1 not working but VERY expensive. 2 working, and even more expensive. But also a fourth one, in parts and with many parts missing. That one is now in my collection. 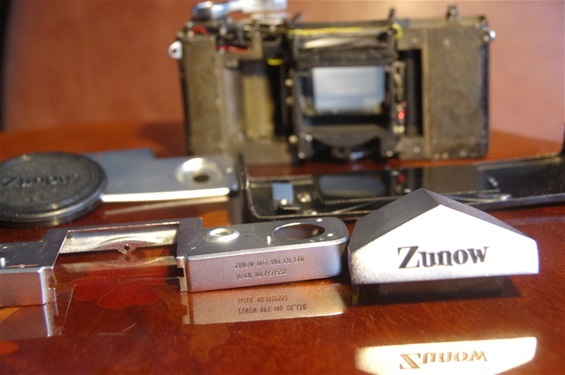 See Zunow and PP SLR 1955-1959. 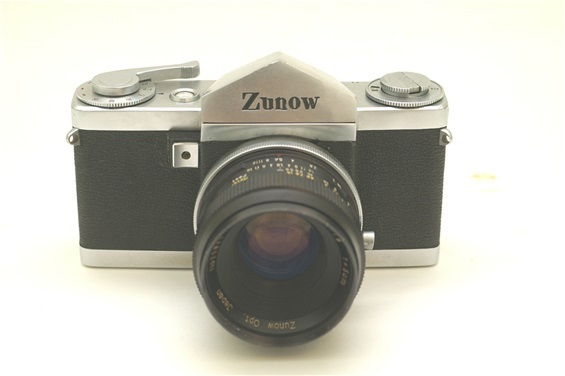 Here is an ultra rare Zunow of 1959, with a serial number beyond the numbers given by any source. Sources so far have anticipated up to 500, after year of production. This one has got number 1959552! Is it an unassembled copy, left behind in the factory after the end of production? That would seem logical hadn't it been for the fact that it seems to be used. And then disassembled. May be for repair? 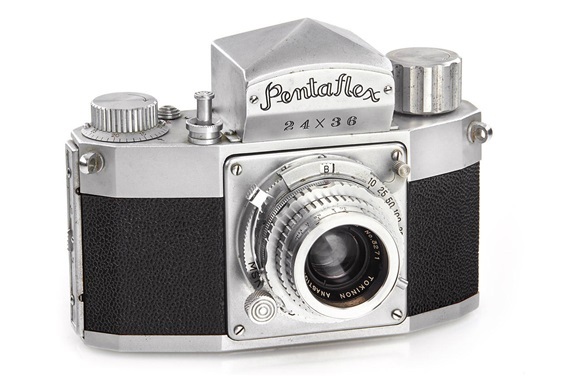 This Tokiwa Seiki Pentaflex was introduced in 1955, four months before the Orion Miranda T. Almost unknown to the public, and with very limited production. Very rare. 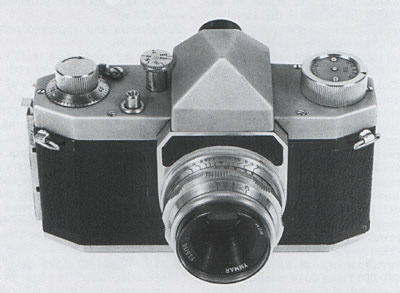 It was Japan's first penta mirror slr camera. See more under Tokiwa Seiki and PP SLR 1955-1959. I have seen two - 2 - for sale! (One of them was sold twice. First on one auction, the on eBay from the Austrian company Photo Alps, for doubled price!) Some call it smart. Some call it greed. 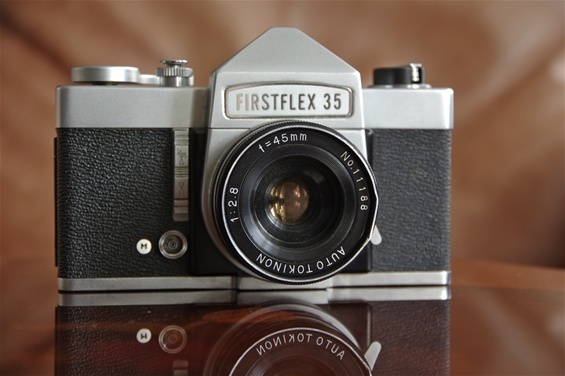 Tokiwa Seiki Firstflex (also Plusflex) of Japan. 1958. Uncertain number produced. This first version is rarely seen. (Once every 2nd or 3rd year?) Less expensive, though, than the Pentaflex. Presented under PP SLR. 1955-1959. Wrayflex II of England. 1959. Produced for about a year, less than 350 pieces. Availability: once a year. 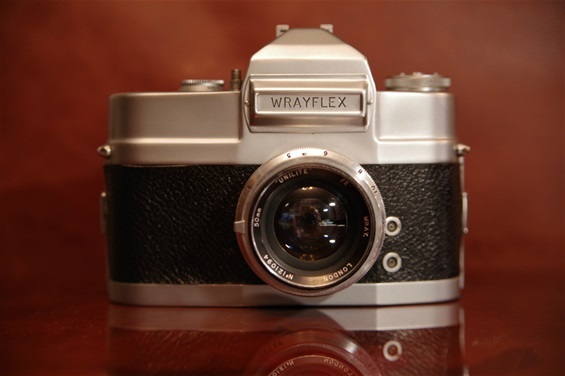 For more info, please see: Wrayflex and PP SLR 1955-1959. The following were prototypes, some possibly only drawings. The Gamma Reflex S of Hungary. 3 prototypes made 1949-50. Lens: Ludwig Meritar 45/2,9. Built at MOM on a Duflex house. A cooperation between Gamma Works and MOM. (Gamma house, MOM prism.) MOM= Magyar Optikal Müvek. Uniflex-Hungaretta of Hungary. Prototype. 1957. Little is known about this camera. Not even further described in "Hungarian cameras". Virax 35 P of Hungary. 1959. Prototype. 3 unnumbered houses produced. Lens: MOM Pannonar 50/2,8. Correcta Reflex I of Hungary. 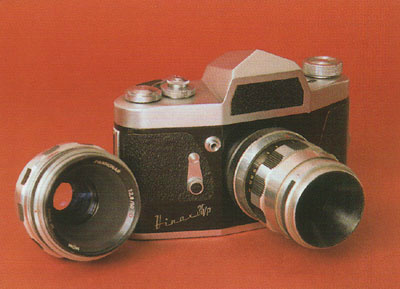 Prototype 1959. In production plans for 1961 at MOM, Budapest, but never produced. 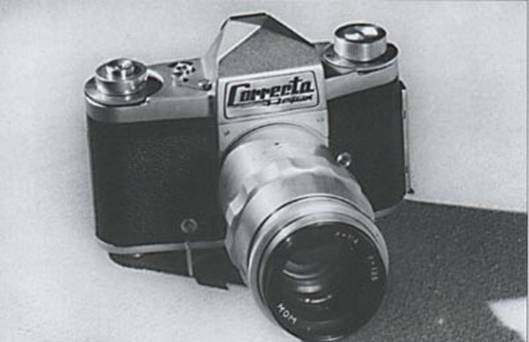 Probably also planned a Reflex II with light metering. Malik of France. Prototype. 1960. 4 lenses were made for it. Impressive! Note the winder to be operated by right hand pointing finger. Only Alpa had this feature. Note a zoom lens to the right! 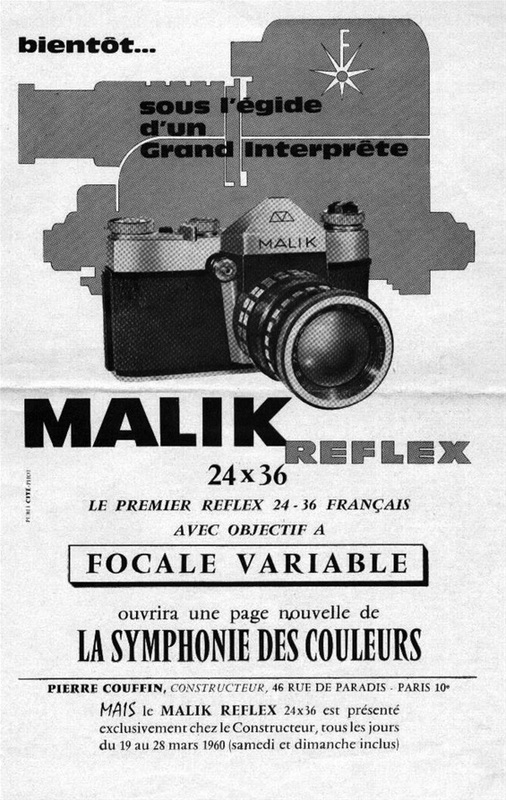 Malik ad. It says "bientot..." Soon. Still waiting. Had I been in Paris between the 19th and 28th of March 1960, I might have seen it. Probably very few did. First with a zoom lens (focal variable).